My sister, Liza told me about a "cowboy town" in Sabandar, Tuaran, which is about 45 minutes drive to the north from the North Borneo (Sabah) capital, Jesselton (Kota Kinabalu). She told me it was a wonderful experience visiting this place. I was excited and made plan to see this "town" for myself. I have never been here, and it took some time for me to find it. Finally, I found the place at last, and indeed it was magnificent! If the place were swarmed by Caucasians, I could have sworn I am in Nashville, Tennessee! I was told foreign investors were the one that set up this place. I tried to find out more about this place in the internet, but didn't find any information. I think this place is very new. I also believe the reason why they built it here was because of its proximity to the Tambalang Horse Race Course just about a mile away. Besides Kota Belud, which is the capital for the "Cowboys of the East" is also close by. But what was interesting were the horses. All are "horses" and not ponies! We are used to seeing the short stumpy ponies called Kuda Padi, which were rode by the "Cowboys of the East", the Bajau horsemen. When I was a teenager, I had learned that ponies is a stubborn stallion while "horses" are more docile and obedient. This was the first time I saw horses very close and indeed they are massive! I agree; since this place is very close to Tambalang Horse Race Course and also Kota Belud, home to the Bajau horsemen, it is then proper to build this Cowboy Town here. But there is another place, where a "town" like this should be built; and it is more relevant. She had a rich history to back herself up if efforts were made to build another Cowboy Town. She is called ELLENA (now known as Kimanis) a forgotten place 45 minutes drive to the south from Jesselton. What is worrying, this place will be turned into another concrete jungle in future. So it is expedient that we save this place see SAVING ELLENA and turn it into something like the SABANDAR COWBOY TOWN. A first English romance-thriller novel from Borneo! Hello Gary. Just go there. At the moment it is still free except paying for feeding the horses. 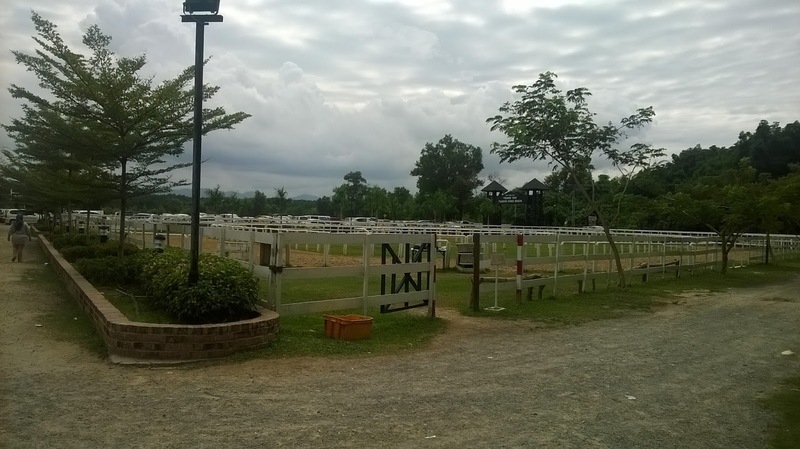 It is located at Sabandar Tuaran not far from the Tambalang Race Course. I have been trying to find more info from the internet about this place but still couldn't. The only staffs at that place are the stable boys. Hope this explanation help. Thanks.